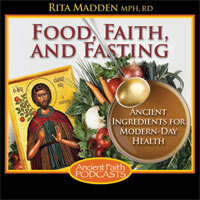 Rita introduces her new book Food, Faith, and Fasting: A Sacred Journey to Better Health, published by Ancient Faith Publishing. Many times we eat outside the home—be it at work, at a friend’s home, or at a restaurant. This podcast will provide strategies on how to eat in a spiritually minded manner in the work environment.